Polishing crystals - carefully selected silica crystals help remove plaque build-up without wearing enamel. Micropearls - polishing particles to clean, smoothen and whiten tooth surface. Pyrophosphates - forms a shielf to prevent plaque adhesion. 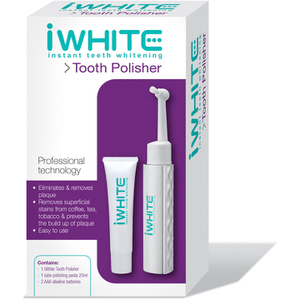 1 x iWhite Tooth Polisher. 1 x 20ml iWhite Polishing Paste. The iWhite Tooth Polisher can be used once a week.